Jen Turano won me over long ago with her ability to write humor into a historical fiction novel. She is now on my short list of favorites…one of my go to guaranteed good reads. This particular title was so good!!! 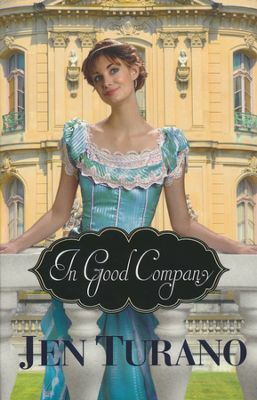 In Good Company is Mansfield Park, meets Jane Austen all wrapped up in a romantic comedy of sorts. This is summer reading perfection! In Good Company is the second book in Jen Turano’s A Class of Their Own series. I did read the first book, which I loved equally, but you definitely don’t have to in order to enjoy this book. I loved Turano’s character Millie Longfellow who is wonderfully flawed, spunky, and is absolutely self-aware. Her position as a nanny lands her in the household of Everett Mulberry (Mr.Darcy if you know what I mean) as part of the help. Everett is desperate for Millie’s assistance as he has become the guardian of three rather difficult children who may very well ruin his relationship with a lady of high society. His future is set…until his heartstrings pull him a different direction. In Good Company will make my list of favorites this year. As soon as I finished it, I download yet another book by Turano. Five stars from this book blogger! I received a complimentary copy of this book by its publisher. All opinions are my own and I have not been compensated.